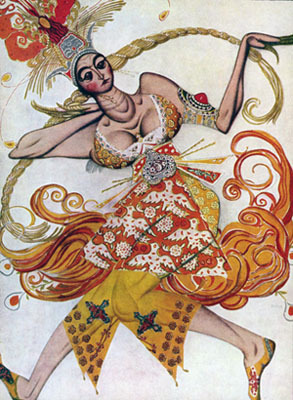 An illustration of the Firebird costume designed by Lev Bakst (Lev Rosenberg, 1866-1924), one of the primary stage designers for the Ballets Russes of Sergei Diagilev (1872-1929). Bakst begin painting in the 1890s and became associated with the Mir iskusstva (World of Art) art movement in Russia where he worked on the path-breaking journal for the movement. He was an absolute brilliant illustrator and one of the key figures in the Russian "Silver Age." Read the textbook chapter 33. Check the remarks by Professor Blois and Professor Evans on Russia's Silver Age. For 50 points maximum extra credit, watch Dama S Sobachkoy (The Lady with the Little Dog) and write a one-page paper about the "little dog." For 50 points maximum extra credit (maybe more), visit Hillwood Estate, Museum & Gardens and comment on the Faberge eggs and the Russian art collection there as respresentative of the Russian Silver Age. For 50 points maximum extra credit, watch Neokonchenaya Piesa dlia Mekhanicheskogo Pianino (Unfinished Piece for the Player Piano) and write a one-page paper of what was so fascinating in the movie. For 50 points maximum extra credit, listen to Igor Stravinskii's The Rite of Spring--You can watch the version in Fantasia (1940) and write a one-page paper in which you explain the historical impact of this piece. For 50 points maximum extra credit, watch a production of one of the performances/choreographies of Diagilev's Ballets Russes and write a one-page paper in which you explain to me what you found so exciting. For 50 points maximum extra credit, read John Bowlt, The Silver Age (1982) and write a one-page paper describing the author's identification of the main features of the Silver Age. For 50 points maximum extra credit, read Aleksandr Blok (1880-1921), Verses on a Beautiful Lady (1904) and write a one-page paper describing some of the main themes of the poems in the context of Russian symbolism. For 50 points maximum extra credit, read Maksim Gorkii (1868-1936), Mother (1906) and write a one-page paper in which you answer the question, "How did Gorkii portray elements of Russian society previously not found suitable for the Russian reading public?" For 50 points maximum extra credit, read Mikhail Artsybashev, Sanin (1908) and write a one-page paper explaining what Russian society found so offensive about the novel. For 50 points maximum extra credit, read Anton Chekhov (1860-1904), Uncle Vanya (1899) or The Cherry Orchard (1904) and write a one-page paper comparing Chekhov's work to that of Henrik Ibsen (1828-1906). For 25 points maximum extra credit, after looking through some of the recommended websites for the Unit, write a long paragraph that identifies some of the unifying features of the Russian silver age.